Heat oven to 425°F. 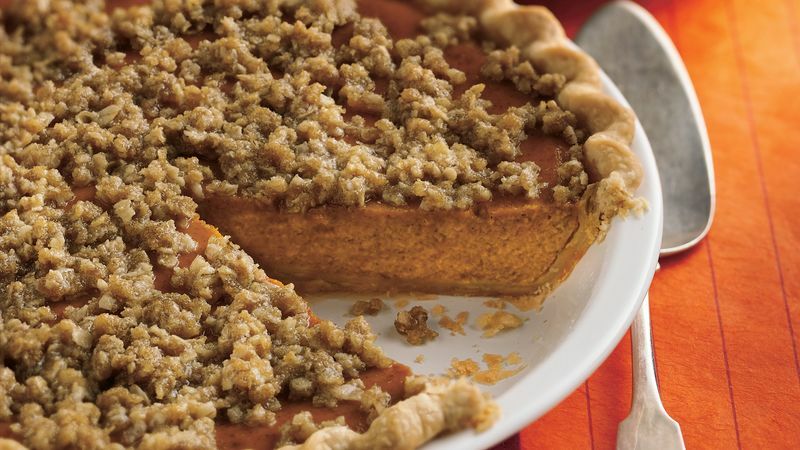 Place pie crust in 9-inch glass pie plate as directed on box for One-Crust Filled Pie. In large bowl, beat all filling ingredients with hand beater or wire whisk until blended. Pour filling into pie crust-lined pie plate. Bake 15 minutes. Remove pie from oven; reduce oven temperature to 350°F. Cover crust edge with 2- to 3-inch-wide strips of foil to prevent excessive browning. Bake 35 minutes. Meanwhile, in small bowl, mix topping ingredients until crumbly with fork; set aside. Sprinkle topping over pie. Bake about 10 minutes longer or until knife inserted in center comes out clean. Cool on cooling rack 30 minutes. Refrigerate about 4 hours or until chilled before serving. Store pie covered in refrigerator.